Dinuguan, or "pork blood stew" in English, is a Philippine food which is a very savory stew of blood and meat simmered in a rich, spicy gravy of pig blood, garlic, chili and vinegar. 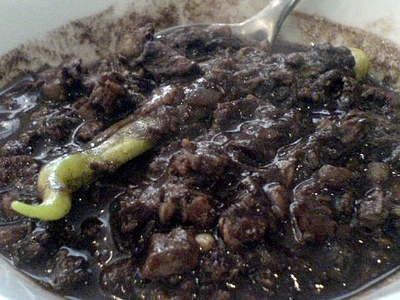 The term dinuguan comes from the word dugo meaning "blood". It is recognizably thick and dark, hence the Westernized nickname "chocolate meat". It is often served with white rice or a Filipino rice caked called puto. Dinuguan is a Philippine food which is a famous Filipino dish with mainly pig blood, garlic, chili and vinegar.It is very rich and delicoius when a litttle sour and hot . When you go to the Philippines, try this exotic food which is condired a traditional Philippine food.